Batgirl 38 showed us the truth about people on social media, they will love you one second, and completely hate you the next second. The revamp of Batgirl has done wonders for the comic and really integrates Batgirl into a real world setting. Anyways lets discuss Batgirl 38! So is Batgirl a superhero or a celebrity? Those lines have blurred in the recent Batgirl issues. 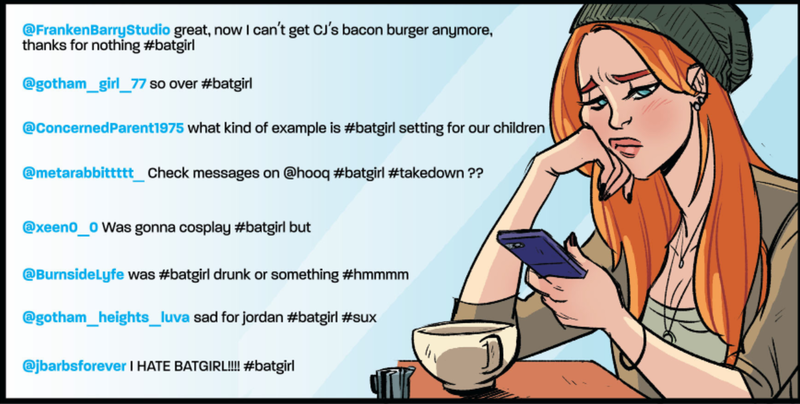 If Batgirl existed in the real world, this is exactly how people would react to her on social media. 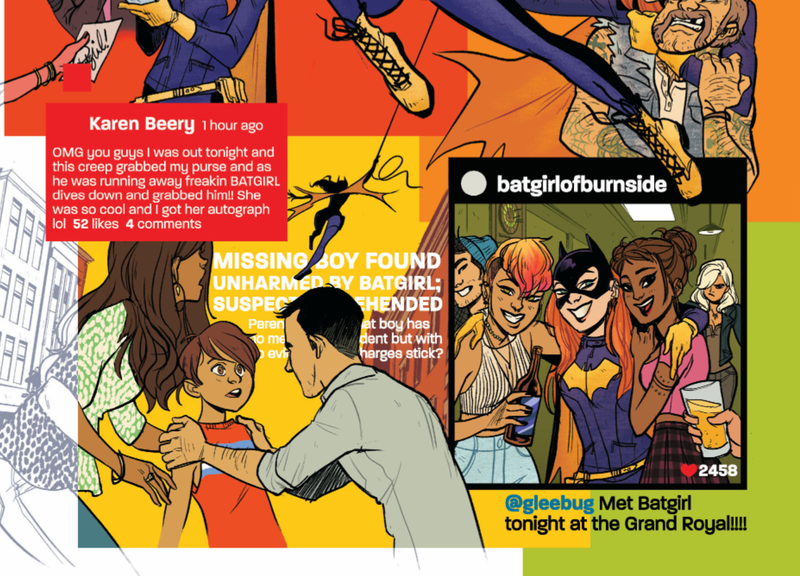 Batgirl 38 shows us that Barbara has become quite the trending topic online. She stops to take selfies with fans and her hashtag on Twitter is constantly getting some love. All her Batgirl adventures end up online, which means she gets a lot of admirers and well stalkers as well. But this is social media we’re talking about, so one bad move and people will be (stupidly) start sending you death threats. Barbara wants to stop a brat reality star from endangering people through his drag racing, however in her efforts she ends up in a sort of drag race herself. This ends up in thousands of dollars worth in damage for local businesses. It doesn’t help that her new cop boyfriend (who hates Batgirl by the way) is the one on the scene. And soon enough the entire internet knows what Batgirl did. It was an innocent mistake, but one mistake is all it takes for all your love on social media to turn into hate. What’s great about Batgirl 38 is that it really modernises Batgirl and her world. 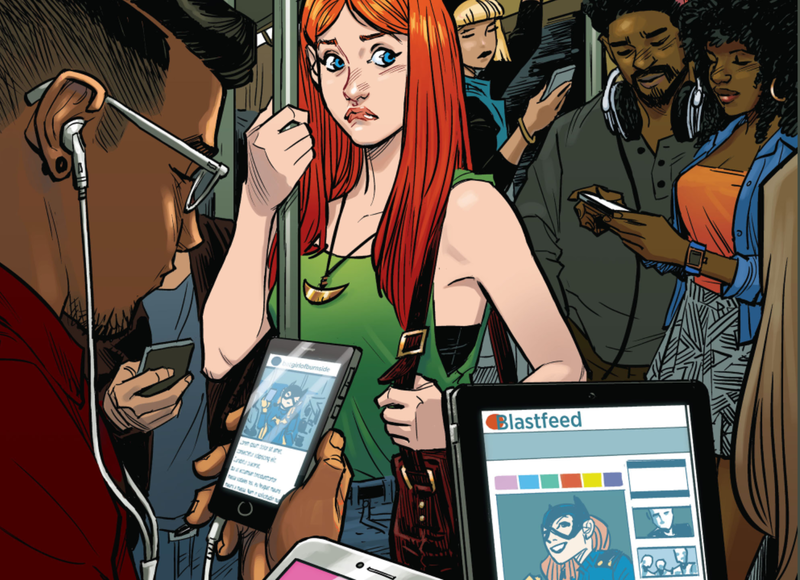 Batgirl is young and of course wants to take up the opportunity to get trending online, and have a lot of her life online, however she soon realises, being an internet celebrity isn’t always a good thing. Not only does she now have social media haters, Tweeting away hate messages, she’s also got someone impersonating her! You put enough information about yourself online, and it doesn’t become particularly hard for someone to steal your identity, which is exactly what is happening to Batgirl now. So for all you kids out there with every piece of information about yourself readily available online, let Batgirl’s debacle be a lesson for you! It’s great to see a comic really integrating the world of social media in their story. Because if Batgirl did exist in the real world I know that I would want to be tracking her every move online. And if I did see her in public, I would totally try to get a selfie with her! Moving Batgirl away from being a dark comic series like other Bat family books has created a much more relatable character and fun world. So if you haven’t checked out the recent Batgirl issues, I definitely suggest having a look at them. Batgirl 38 by Cameron Stewart, Brenden Fletcher and Babs Tarr is now available published by DC Comics. I’m starting to understand why Batman decided that he just didn’t give a damn what anybody else thought about him! Haha yepp it’s probably a lot easier than to deal with all this stuff! I just bought the last few issues, they have been a fun ride so far. They have been, really enjoying this new direction they took! Ive been a fan of the art, its youthful and fun! I love the art too! Such a unique style! This is EXACTLY why Batgirl’s new direction is working so well. Removing the Oracle component of Barbara Gordon’s life regresses her back to the smart girl still approaching full adulthood. She becomes very much the college-aged student that her age suggests. College-aged readers are the key market comics are missing; unlike adults (who tend to focus on the critically-praised and what they loved as kids) and little kids (who want the film characters and get what their parents liked on top), college kids are more discerning. So in order to make the story relevant to them, it has to deal with issues that college kids deal with. Social media is a very real issue, as is the impact of celebrity these days. There’s also a running subplot about technology ownership and hacking in there too, along with academic integrity. Hooking up electronically through dating sites is icing on the cake. She won’t be the only hero to go through this either. Reading Supergirl at the moment, you get the impression that the present creative team is looking to go back to a more 80s-type writing in which the young heroine is searching for personal identity in this world through school, work, etc. more than just beating up super villains. This feels like it could’ve been used for Stephanie Brown when she was Batgirl. I’m all for change, but this is a total 180 for Barbara Gordon especially after everything she went through in Gail Simone’s run. Speaking of which it’s like DC has something against Gail Simone since they fired her once on the series then get rehired due to fan backlash and once she left for good they do this hipster run. The first trade collection is called Volume One despite collecting issues 35-40, the previous issues were collected as Vol. 1-5, and this trade like other recent DC trades of other New 52 series got rid of the New 52 brand, but the others continue the numbering.